Stroke can be devastating and debilitating. Women are now having more strokes than men. There are lifestyle changes that women can make to prevent or lessen their chances of developing a stroke. These 5 lifestyle changes are: maintaining a normal blood pressure, maintaining a normal weight, maintaining a normal cholesterol level, getting adequate exercise, and maintaining a normal blood glucose level. Heart disease is the leading cause of death in America for women. Twenty-five percent of all women will die from cardiovascular disease. Heart disease has traditionally been thought to be a “man’s disease”. Therefore, when women presented to the emergency department with cardiac symptoms, they were told that it was just “acid reflux or anxiety”. However, there has been an increased awareness of women and heart disease in the past decade. The Go Red For Women campaign has been instrumental in getting the message out to healthcare providers and women that heart disease is not a “man’s disease”. It is estimated that 65% of women who die suddenly of coronary heart disease have no warning symptoms. The most important modifiable factor in preventing a stroke is to have adequate high blood pressure control. Seventy-five percent of women who have a stroke had a diagnosis of high blood pressure. Nearly half of all adults with high blood pressure are women. Blood pressure is defined as the force of your blood pushing against the walls of your blood vessels. The problem with high blood pressure is that it is literally a “silent killer”. 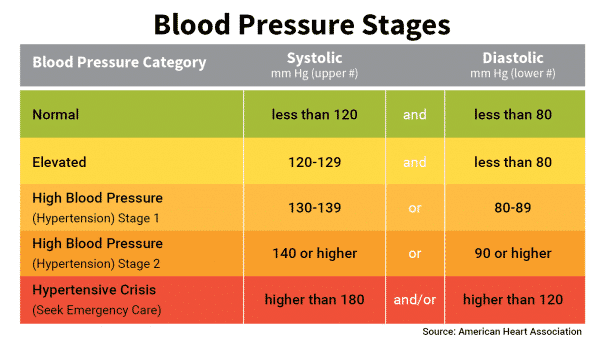 Often times, once an individual finds out they have high blood pressure, organ damage is already present. High blood pressure can damage the brain, heart, kidney, and eyes. Studies have shown that women are, less likely than men to have adequate blood pressure control. The Women Estrogen Stroke Trial showed that even when women had already had a stroke, they still did not have adequate blood pressure control. Some women are more prone to high blood pressure because of the childbearing years, taking birth control pills, and smoking. The American College of Cardiology came out with new blood pressure guidelines for all adults. When women have high blood pressure because of birth control pills, the pills need to be stopped and sometimes the blood pressure will go away. Women with gestational high blood pressure usually get rid of the high blood pressure when they lose the baby weight. There are a plethora of blood pressure medications that an individual can take. However, modifying lifestyles will normally work in most cases. There are natural remedies that an individual can take such as aged garlic, celery, and hawthorn. At some point over 90% of women have been on a diet to lose weight. There are some people who lose easily, and some people who can’t lose any weight at all. It is important to maintain a normal weight to prevent a stroke because the majority of the risk factors for a stroke are related to weight. 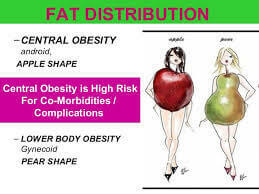 For example, diabetes, high blood pressure, and high cholesterol are all complicated by obesity. Obesity is a strong indicator for having a stroke in women. 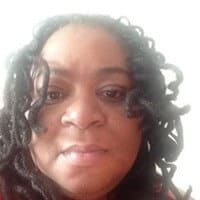 Research has shown that women who are obese, have a greater chance of developing coronary artery disease, insulin resistance, and heart attack. Obesity can cause a stroke because fatty tissue causes inflammation. Inflammation leads to blockages in the arteries, which can lead to circulation problems. Overweight people have a greater chance of having sleep apnea. Sleep apnea has been directly linked to heart attacks and strokes. Overweight people tend to have enlarged hearts. This is due to the increased pressure and strain of the heart. There are so many diets out there. However, research has shown that insulin plays a role in obesity. Therefore, diets that have a low carbohydrate intake are very successful at weight loss. This is because, in response to a person eating carbohydrates, the person makes more insulin to handle the high sugar intake. Insulin is known as the “fat hormone”. Dr. Fung, author of The Obesity Code, according to Dr. Fung, “Everything you believe about how to lose weight is wrong. Weight gain and obesity are driven by hormones—in everyone—and only by understanding the effects of insulin and insulin resistance can we achieve lasting weight loss”. There has been many research studies done on low carb and ketogenic diets. These diets have been proven to be safe for long term weight loss as long as the diets are followed. Studies have shown these diets to be effective in reversing diabetes, high blood pressure, and high cholesterol. Everyone has heard about how cholesterol is bad and the key to avoiding heart disease is to lower your cholesterol. Pharmaceutical companies and health care providers are prescribing Statin drugs to the tune of over 200 million prescriptions per year. These Statin drugs were supposed to prevent some people from getting heart disease, but the rate of heart disease worldwide is increasing. These Statins also have some bad side effects such as muscle pain and joint pain. High cholesterol blocking the arteries can cause blockages in the arteries that can lead to a stroke. 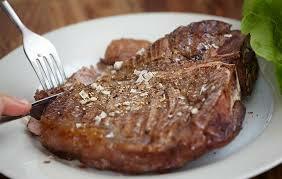 A ketogenic diet has been shown in studies to lower cholesterol levels. A ketogenic diet is safe to follow for a long period of time to lower cholesterol levels. Exercise is known to lower cholesterol levels. Walking just 30 minutes a day will decrease the bad cholesterol and increase the good cholesterol. All of these interventions are intertwined because weight loss also has an enormous effect on cholesterol levels. These individuals typically have an “apple” shape where most of the fat is located in the abdomen. This type of shape has been implicated in heart disease. Fortunately, exercise helps to get rid of this fat. People with an apple shape typically have high blood pressure, glucose intolerance, and bad cholesterol. In these patients weight loss alone can have a dramatically beneficial effect on lipid profiles. This garlic has been proven to help lower cholesterol. It is estimated that the majority of strokes are preventable. 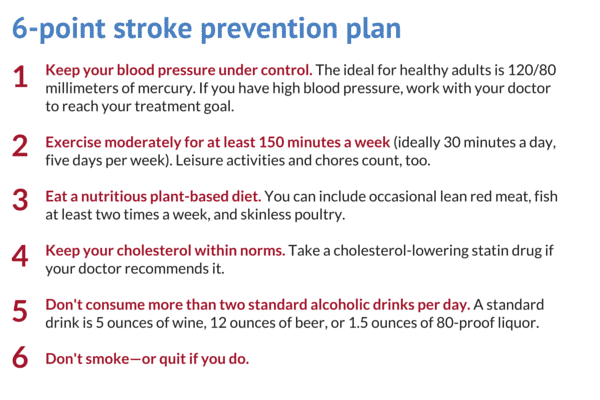 So many of the risk factors for stroke can be changed with lifestyle changes. Physical activity improves vascular function and stroke risk factors. The well-known health benefits of regular exercise include reducing the risk of high blood pressure, diabetes, obesity, depression, and joint pain. There are many forms of exercise such as aerobic, strength training, running, swimming, etc. However, the easiest and the most simple exercise is plain old walking. Walking just 30 minutes a day has been proven to decrease the risk of stroke and heart attack. Exercise and weight loss had a significant effect on decreasing triglycerides, increasing HDL, and decreasing blood pressure. Diabetes is a significant risk factor for stroke. There is a direct correlation between diabetes and stroke. People with diabetes also develop heart disease at a higher rate than people who do not have diabetes. When an individual eats food, normally the pancreas will supply the correct amount of insulin to help digest the food. For people who have diabetes, they do not produce enough insulin, therefore, they end up with too much sugar in the blood. Over time, this sugar will lead to fatty deposits or clots inside of the blood vessels. These clots go up to the brain and causes strokes. The warning signs of a stroke for a person with diabetes is the same as regular symptoms of a stroke. It is important to monitor your blood sugar with a glucometer. Exercise and low carbohydrate diet are the single most important interventions to control diabetes. -There are a plethora of opportunities for primary health care providers to help women prevent stroke. Research has already shown us that stroke is largely preventable with lifestyle changes. Physicians need to become aware of the evidenced-based guidelines, and they need to implement them to improve the healthcare of women.